Zombies in a period piece? It sounds insane, but this crazy idea works surprisingly well. Based on the 2009 parody novel by Seth Grahame-Smith (and Jane Austen), Pride & Prejudice & Zombies is a quirky film with a little something for everyone: Romance, Action, and Zombies. In 19th century England, a plague has spread across the country which causes the dead to rise. The army is struggling to defend London and the wealthy have trained in martial arts to combat the undead. And while this is all very upsetting and terrible, Mrs. Bennet has more important things to worry about, such as finding good husbands for her five daughters. However one of her daughters, Elizabeth, “shall never relinquish [her] sword for a ring”. Who could have guessed Jane Austen would have written such a badass and kickass heroine? Elizabeth Bennet is not only quick witted, but quick killing. Lilly James did an excellent job portraying Lizzy’s fierce combative skills, both on the zombie battlefield and in conversation with the broody Mr. Darcy (Sam Riley). Riley brought an intensity to the zombie-killing Colonel that was off putting. Mr. Darcy of the original Pride and Prejudice comes off as arrogant and awkward, where Riley’s portrayal is more abrasive, colder, and seems more annoyed at his feelings for Lizzy than anything. The addition of this cold, zombie-slaying persona makes Darcy more intimidating, and makes his love of Lizzy more powerful. Matt Smith’s portray of Parson Collins that steals the show. Smith’s physicality as an actor and his limitless charm turns the Parson into dimwitted clown of a man. You can’t help but feel sorry for him as he attempts to woo one sister, then another, without success. Without Smith, the film would feel like a strange, dry re-telling of Pride and Prejudice with Zombies crammed into it rather than the delightful quirky action-comedy it is. While the film is wonderful, it lacks much of the humor of the original book. Much of the dialogue is dry, and very Austen. The film relies on the juxtaposition of the elegant discussions of refinery and class with zombies for most of its laughs, rather than the dialogue from the book, which was filled with double entendres about balls. If not for Parson Collins, the film would be unbearable dry. Costuming and set design for this bizarre period piece are excellent. Unlike some other “modern” period dramas, the costume designer chose to stay true to the era. The Bennet sisters are all dressed appropriately for Georgian Era England, with the exception of some training and combat outfits, as a true lady would have never worn trousers. The sets are beautiful and grand while landscapes are eerie and haunting, perfect for a zombie apocalypse. The action sequences were well choreographed and shot. The first zombie-killing scene opens with a bang (literally) that will make you jump (literally). The girls’ costumes flow beautifully as they deliver roundhouse kicks to zombie skulls, and the sword play is mesmerizing to watch. And those looking for zombie gore will be happy to see blood fly onto the camera lens and watch zombie skulls get curb stomped. 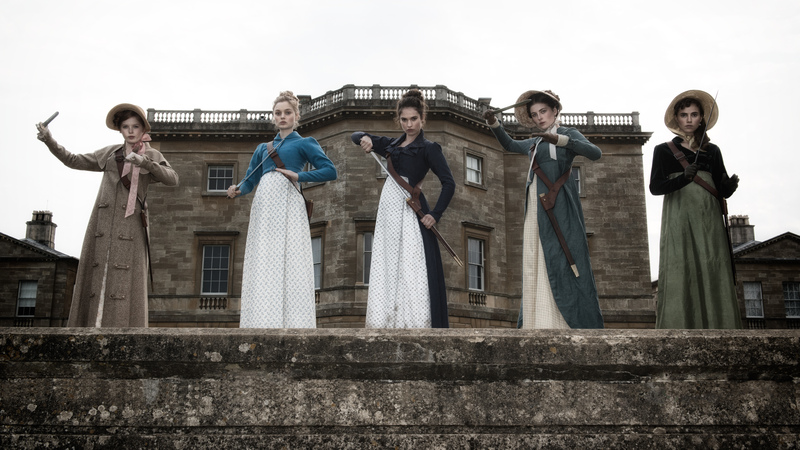 Pride and Prejudice and Zombies is an action-packed period piece…with zombies! Filled with plenty of startling zombie kills and romance, it has a little something for everyone to enjoy! This entry was posted on Friday, February 5th, 2016 at 9:48 am	and is filed under Film, News. You can follow any responses to this entry through the RSS 2.0 feed. You can skip to the end and leave a response. Pinging is currently not allowed.